Meditation is one of the most powerful means to improve your mind as you age. But some folks have trouble sitting still for any length of time. Others find that despite their best efforts, they aren't able to stop attending to distractions. What if you could utilize simple audio technology to ease your brain waves into patterns that are indistinguishable from those of someone who has practiced meditation for decades? There is a way, and the technology exists. Based on decades of validated biofeedback research, brain wave training can help you experience the many benefits of meditation and optimize all aspects of cerebral performance. 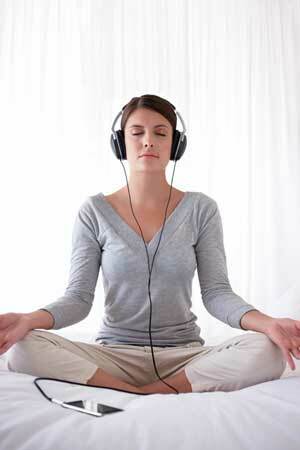 As Edward A. Taub, MD, explains, "You don't have to learn how to meditate; this technology literally meditates you." Brain wave training utilizes an audio technology that synchronizes and balances your brain for greater resilience, brilliance, and flexibility. It facilitates the remarkable mental state known as hemispheric synchronization, which supports whole-brain thinking. Most people tend to favor one hemisphere over the other or shift between left-brain (analytical) and right-brain (imaginative) dominance in cycles that last from thirty minutes to three hours. While one hemisphere is dominant, the attributes and skills of the other are less available. When both hemispheres operate in harmony, you enjoy a profound synergy of logic and imagination. Your mind becomes sharper, more focused, and more lucid. You synthesize and solve problems with greater speed. And you may be delighted to discover that you are more in touch with your emotions and intuition, and more receptive to creative insight. Robert Cosgrove, MD, PhD, a biomedical engineer and expert in reversing the negative effects associated with age, notes, "Technologies altering brainwave patterns have great potential for promoting optimal cerebral performance, and long-term use may delay deterioration of the brain traditionally associated with aging." In addition to preventing decline, brain wave training may also be helpful in improving intelligence throughout life. Siegfried Othmer, PhD, another pioneer in the field of biofeedback, reports that brain wave training can improve performance in reading comprehension, memory-related tasks, and logic-handling abilities. In one study of children with IQ scores below 100, Othmer found that brain wave training resulted in average gains of 23 IQ points. Furthermore, one year later, the subjects had maintained their gains as well as demonstrating significant improvements in self-concept, creativity, and concentration. For many years, brain wave training involved going to a therapist's office, having electrodes applied to your scalp with a sticky paste, and sitting in front of a computer screen while you learned how to manipulate your brain waves into the ideal states for creativity, concentration, stress reduction, a good night's sleep, or meditation. Biofeedback research has accelerated dramatically over the past thirty years. New technology makes brain wave training accessible to anyone with a pair of headphones and an audio player. Brain Sync harmonically layers pure and precisely tuned sound waves called "binaural beat frequencies" behind soothing musical tones to gently guide your brain into balance. A binaural beat frequency is an audio phenomenon that occurs in the brain when two slightly different sine waves are delivered to either ear through headphones. A sine wave is a continuous wave with a constant frequency and amplitude. For example, a sine wave of 100 hertz played in the left ear plus another one at 107 hertz in the right ear will produce a perception of a pulsating beat of 7 hertz. In other words, the two hemispheres of the brain function together to "hear" not the external sound signals but instead a third "phantom" beat, which is the mathematical difference between the two tones. The beat is not coming through the headphones but is perceived and experienced within the brain. It sounds like a soft, gentle drumbeat. Discovered in 1839 by German physicist Heinrich Wilhelm Dove, binaural beats were just a curious anomaly until 1973, when Gerald Oster, MD, published his landmark article entitled "Auditory Beats in the Brain." Working at Mount Sinai Hospital in New York City, Dr. Oster found that binaural beats evoked change in the electrical activity of the listener's brain. This tendency for brain waves to resonate sympathetically is known as the frequency following response. In the same way you might tap your foot to the rhythm of a song, brain activity naturally falls into rhythm with binaural beats. This frequency-following response means that binaural beats can be orchestrated to influence our brain waves, thus altering our states of consciousness. Different brain wave types are associated with different mental states, such as alpha for relaxation, beta for concentration, theta for meditation, and delta for sleep. Brain waves, represented by squiggly lines on an electroencephalogram (EEG) monitor, show the speed at which neurons fire. Each time a neuron fires, an electromagnetic spark of energy is released, setting off a chain reaction among other neurons. The speed of the connection correlates to the speed of the frequency. For example, beta brain waves (associated with alertness) oscillate at much faster speeds than delta waves (associated with sleep). Based on the book Brain Power, ©2012 by Michael J. Gelb and Kelly Howell. Reprinted with permission of New World Library, Novato, CA. www.newworldlibrary.com or 800/972-6657 ext. 52.